An ESL lesson plan for teaching conditionals to intermediate level students (B1). Use this as a stand-alone ESL lesson plan, or to supplement an existing one on a similar or related topic. The best way to view this content is through the TEFL Handbook app. So if you have an iOS or Android device, be sure to check it out. The board work below shows one way that we can introduce this topic. 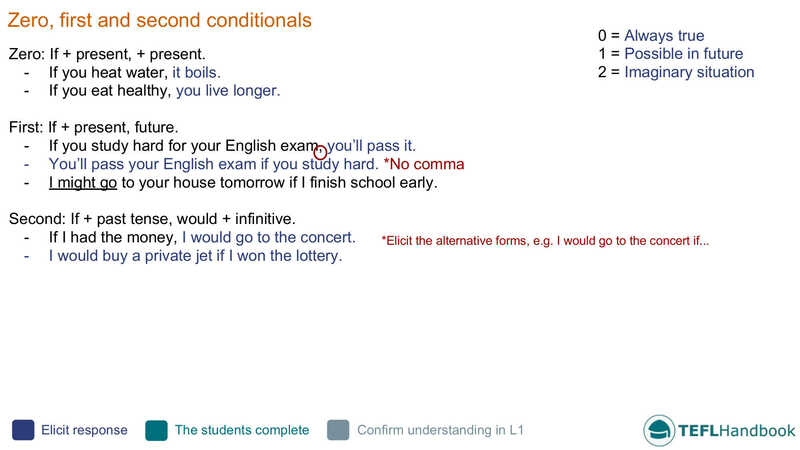 Step through each of the conditionals, explaining their functional use and demonstrating some examples. Use the colour-coded text to give you an idea of how the student-teacher interaction should play out. Try to elicit further examples to confirm that your students have understood the points that you have presented. 1. You’re unhealthy because you eat too much fast food. 2. They have no money because they don’t have a job. 3. I lost the match because I played badly. 4. He’s always tired because he goes to bed too late. 5. We’ll have to walk to work because we don’t have a car. Once they have finished, they should compare their answers with a partner. 1. If you didn’t eat fast food, you would be healthy. 2. If they had a job, they would have money. 3. If I played well, I would have won the match. 4. If he goes to bed earlier, he won’t be so tired. 5. If we had a car, we wouldn’t have to walk to work. Encourage them to be as imaginative or funny as possible and review the results in reverse at the end. Groups will find it interesting to see how different/similar their ideas are. Student A: If I get some money, I’ll buy a car. Student B: If I buy a car, I’ll drive to Portugal. Student C: If I drive to Portugal, I’ll go to the beach. You’ll need a dice or dice app on your phone to play this whiteboard board game that practises conditionals. Start by drawing a path from one side of the whiteboard to the other. Make the board as long as you want, but 15 to 25 spaces should be enough. On each turn, one student will have 30 seconds to describe a random topic/word to their teammates using only conditional statements. If the team guesses the word correctly, that player rolls the dice and moves to the new space. Use vocabulary or concepts from a themed vocabulary list for intermediate level students. We hope that you were able to grab a few ideas from this lesson plan. Our suggested next lesson is on the passive voice. Be sure to check out our complete selection of intermediate level lesson plans. For other levels, have a look at the entire collection of ESL lesson plans. Also, if you are an iOS or Android user, the best way to view this content is through the TEFL Handbook app. An ESL lesson planner for English teachers, designed for in-class use.